The Garmin Forerunner 201 is the first all-in-one personal training device that uses GPS satellites to calculate speed, distance and pace. With no calibration required the Garmin Forerunner 201 are extremely easy to use meaning you'll be out running in no time. 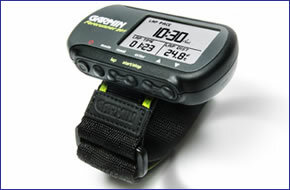 Garmin Forerunner 201 has been discontinued. You don't even have to think about starting and stopping the elapsed time or punching the lap button to record stats, the Garmin Forerunner 201 will do it automatically. And when you need motivation to keep going, Forerunner's Virtual Partner feature lets you input pace, time and distance goals, and then displays if your ahead or lagging. The Garmin Forerunner offers you an easy-to-read display, ergonomic wristband, and integrated GPS sensor that provides precise speed, distance, and pace data. It's compact, lightweight, and waterproof and packed with features for today's serious competitor. The Garmin Forerunner 201 delivers the benefits of GPS technology at an affordable price. Working out with the Garmin Forerunner 201 means you're never alone in your personal training, because the unit provides a Virtual Partner. This unique feature allows you to set your training goal by configuring your Virtual Partner's pace and workout distance. You'll get a graphic perspective of your performance by viewing your pace in relation to your Virtual Partner's pace, so you can always see at a glance if you're keeping up or falling behind. Do you have a question about the Garmin Forerunner 201 or other handheld GPS related question that's not been answered on this webpage? Please see our handheld and Outdoor GPS FAQs page for questions from other customers.Plus if the answer to your question isn't featured, use the online form to ask us for the answer. Alternatively please telephone 01733 777623 Monday to Friday (9:30am-5:00pm) to speak to one of our sales team. The Garmin Forerunner 201 will also calculate the amount of calories you have burned over the course of a workout.